Will John Delaney be remembered at the Siege Dinner? The “Ned Kelly Siege Dinner” is to be held in two weeks’ time at Glenrowan. Ive already written my thoughts about it HERE. The question I asked then, and still haven’t had an answer to, is what on earth are you going to be celebrating? Ive been much too busy this week to do any serious reading for the blog, but I am going to bring to the notice of Siege Dinner attendees one of the incidents that took place during the siege so they can think about it as they listen to the live music from Damien Howards new CD “Ned”. 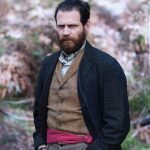 In one of his songs you might hear Ned Kelly say “I’m not the one who started this fight”and “Authorities heavy hand turned me to crime”. 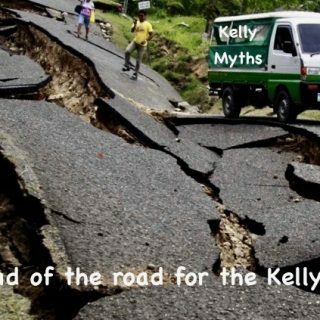 I’m sure you all know Kelly was lying when he said that! But the incident I want you to specially recall is what happened during the siege to eighteen-year-old John Delaney, one of the hostages imprisoned inside the Ann Jones Inn. I want you to think about the kind of person who would subject this young man to such a tirade of abuse and threats and bullying, to such devastating public humiliation over half an hour or more, that the poor fellow was reduced to a weeping wreck, believing he was about to be shot in the head, murdered. I want you to ask yourselves as you commemorate the Siege and the ‘heroic’ last stand of its creator, how you would have felt if it was your own son being subjected to this vile abuse, and if you really feel so great about celebrating someone who amused himself by such things as pushing the barrel of a loaded gun into an old mans mouth at Euroa, and by bullying a kid by putting a loaded gun to his head? Frankly I would be embarrassed to be toasting such a person. “In the case of John, Ned has a problem. For it has come to his ears that not only had John Delaney’s father , the Greta blacksmith sold a horse to the Victoria Police Force, but young John himself had recently done a favour for a policeman and infinitely worse, even tried to join the Victoria Police. Well in Neds book this is a crime punishable by death, and he is just the man to do it. 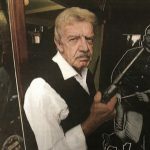 Pointing his revolver at the terrified young man who has tears running down his cheeks and onto his shirt Ned says to all who are listening that he would personally ‘have the life of anyone who aided the police in any way or even showed a friendly feeling for them. ‘I can and will find you out’ he goes on. ……. ‘But I’m a fair man he says’ and he takes his pistol from his belt and holds it out to Delaney, daring him to take it, telling him he could even take the first shot! Of course the still sobbing now shaking young man refuses to take it. Q17632. That young Delaney has been convicted of some offences; did he appear to be a sympathizer? -He was as white as a sheet. He was really frightened; he could not make himself so white and trembling as he was. Q17633. He has been sentenced for some offence? -Yes. Q17634. Is that the boy you referred to as applying for admission to the police ? -Yes, that is what Ned Kelly said. Q17635. You do not think it a ruse of Ned Kelly’s? -I did afterwards. I did not at the time, but after I did think it was a ruse on Ned Kelly’s part, though not on Delaney’s. Delaney, I think, really thought Ned Kelly in earnest. In other words, Curnow concluded that Kelly didn’t ever intend to shoot John Delaney, but use him in a stunt designed to keep everyone at the inn afraid and uncertain about what might happen next. To Kelly sympathisers this means it was all fine – Delaney was never actually going to be shot, Ned Kelly was just mucking around, having a bit of fun, nothing to see here! In fact it was an act of despicable cowardice, of bullying and mental torture that demonstrates again the way in which the mind and personality of a psychopath works. For women, like Mrs Scott at Euroa, Ned wore a veneer of smiles, flattering charm and exaggerated deference to gain control. Here, he used fear and threats of violence against an innocent youth. In both cases he would have greatly enjoyed himself and couldn’t have cared less about the feelings of his victims. Such is a psychopath. It’s not always about the Kellys. In this instance it may very well be. We’re forgetting it’s a fund raiser under the umbrella of the long lost and forgotten siege dinners; clever move on behalf of the organizers. Some will be attending to put names to faces, foes sizing one another and above all friends catching up for a drink or two. Who knows I might end up meeting you there Dee. Wouldn’t that be special? On a serious note I’ll have to agree with you. Why bother celebrating that horrible event. F*#k sake the poor souls of those that perished won’t be amused, nor will the 3 slain troopers and their families. The attendees need raise a glass to each of the lost souls, and a prayer wouldn’t hurt either. Amen and God bless you all. Of course Delaney will not get a mention at the Siege Dinner. However, the siege itself is one of Australias historic moments. Hence the event being held. Arthur, Gascoigne, Dwyer, Reynolds, Mortimer, McAuliffe won't get a mention either. Considering the siege dinner is a fundraiser for a monument to a triple murderer and attempted train massacre psychopath it is the one place I will not be going that night. Those idiots aren't going to have a Lindt café killer dinner are they? I can't see any difference at all. I bet poor old Metcalf won't get a mention either. He was the fellow Ned shot in the eye as he was fiddling with Piuzzi's revolver before the siege had begun. Negligent Ned and Bad Ned he may be. But Metcalf and Delaney will still not be getting a mention at the dinner. It's all about the logo and the iconography. When will you guys get that? Because of the Helmet logo and the silhouette if you like, Ned Kelly is never going to go away. Simple. Fact. 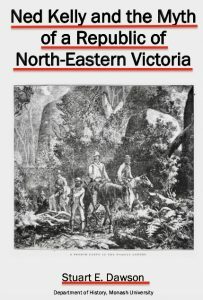 Hi Roy, can I just put in a plug for my article, "Ned Kelly's shooting of George Metcalf, labourer", free to download from the Monash Uni website if anyone hasn't seen it. Find it by Googling the title. 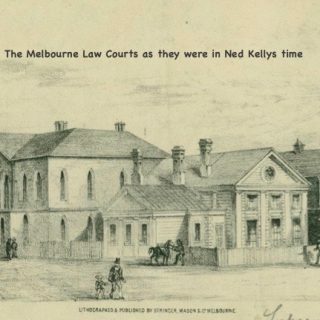 It shows in great detail how a couple of well-known historians went out of their way to distort, twist and pervert the historical evidence so as to blame the police for Metcalf's injury, when it is well attested by several witnesses to have been caused by Ned Kelly, as you said, fiddling with someone's revolver. It's hard to believe some of the Kelly fans don't want to accept well documented historical facts when they are dug out and presented to them, but prefer to keep on believing fairy stories about Saint Ned. It shows they are not interested in Australian history but in some kind of weird cult. Such is life. What you seem to be saying, Mark, is that the Ned Kelly brand is impervious to facts, and relies on invented fiction. Not a good look. No, I am not saying that at all Roy. I am saying that the brand, the logo, the image, is too strong to be fully defeated. No matter how many facts come to light or unpalatable truths proven, there will still be a very large brigade of those that will never hear it. The helmet and the bearded execution pic of Ned have transcended history . They have become a commodity. This is why you, Dee, Stuart and me to a degree even, will never fully prevail. Maybe that's the thing about myth, that facts don't matter. But on the other hand maybe there is a point where the facts are so overwhelming that a piece of myth is crushed beyond all repair. 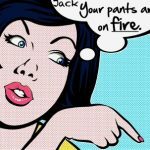 It is impossible for anyone who read my "Redeeming Fitzpatrick" article to still say that his testimony was lies, simply because it has been fairly well corroborated. People can still say they don't like him for various reasons, but they can't say his testimony doesn't hold up to scrutiny. Now supposing it was shown that there are no grounds to believe that Ned and the boys ever had a thought about starting a republic. 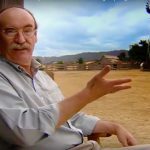 Not just because there is no documentary support for the idea, but because the claimed oral history is also full of contradictions and doesn't add up. I wonder how many people would continue to believe it was somehow true, even if it became historically clear that it wasn't. Yes Mark youre right that "we" will never fully prevail. Thats because as you and Stuart both say, for believers in myth, facts are irrelevant. 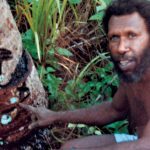 Thats why all kinds of mad religions exist and why there are people who still think the earth is the centre of the universe and the earth is flat, that the Twin Towers disaster was a CIA plot, the moon landing s were faked and L Ron Hubbard was a visionary, that Dan Kelly is buried in Queensland…and so on and so on. The reality is that not everyone understands or cares about logic, about rational argument, about reason and facts, and there will never be a time when everyone does, and so there will always be believers in non-rational explanations of things and of history. So yes, in that sense the Kelly mythology will always be with us, but as is already evident, the core believers are already a shrinking tiny minority and the shrinking will continue. NO way is there even now ' a large brigade ' of Kelly believers. All the evidence of whats happening on the Facebook pages and internet places of kelly supporters shows that they are disappearing, or falling silent – no doubt about it! 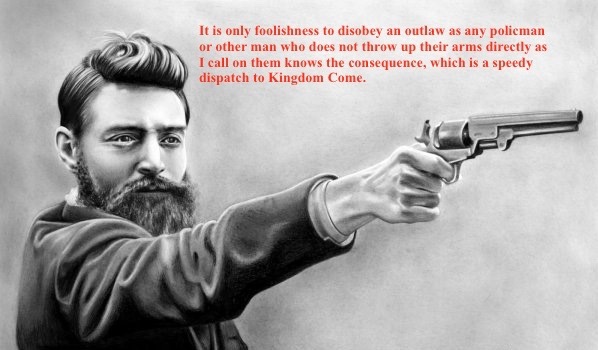 New generations learning about Ned Kelly for the first time may well find him fascinating and interesting, but they wont have the wool pulled over their eyes by the Kelly myth-makers who are now in serious decline. Instead they may well learn about the myth, but they will also learn the facts, and if theyre logical and rational folk, they will follow reason to its logical conclusion. Not to mention that quoting Fitzsimmons book is all good and well but I throughly everyone knew it was NOT historically correct. An author penning such a story has to realise that you only need to get one detail incorrect an you cast a shadow on the entire work. I don't hold the Fitzsimons book in very high regard.